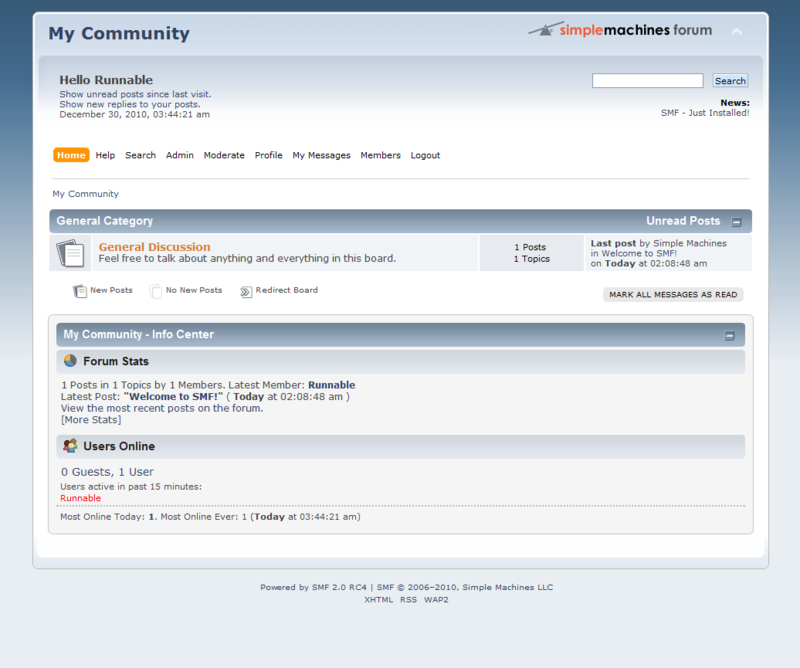 Want to quickly see how the open-source software Simple Machines Forum works? You'll find a free and updated demo installation of Simple Machines Forum here. We are currently updating the Simple Machines Forum demo. Please check back shortly. There will be a new version up soon. Simple Machines Forum, also known as SMF is an open source, Internet forum, message board developed using PHP as a programming language that uses a MySQL database management system. On June 6, 2001 sixteen year old Zef Hemel along with collaborators Jeff Lewis, Corey Chapman, T. Oswalds, and Matt Mecham released the first open source bulletin board written in Perl called YaBB 1.0. Based on that project, but featuring a different approach,Simple Machines Forum 1.0 Beta 1a, was released on September 30, 2003. Simple Machines Forum features include a powerful Package Manager that allows you to customize the software and change its appearance choosing one of the different themes available. You can get a review of the internet forum if you login to our Simple Machines Forum demo using the links above. The online demo allows you to set up your own online community within minutes. 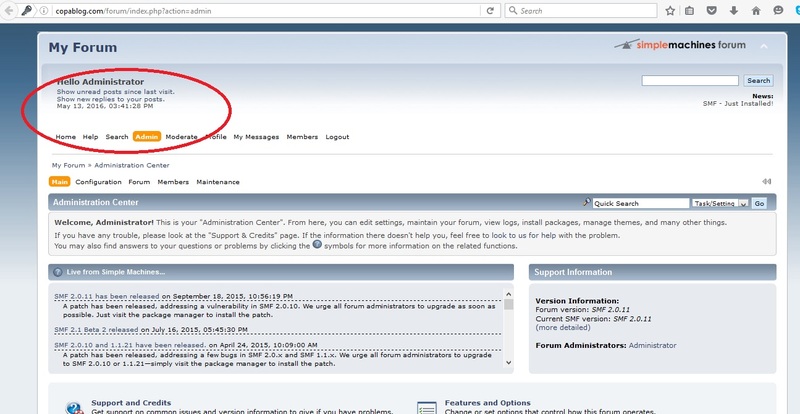 The Simple Machines Forum SSI function, which stands for Server Side Includes, makes it easier for your forum and demo site to interact with each other. 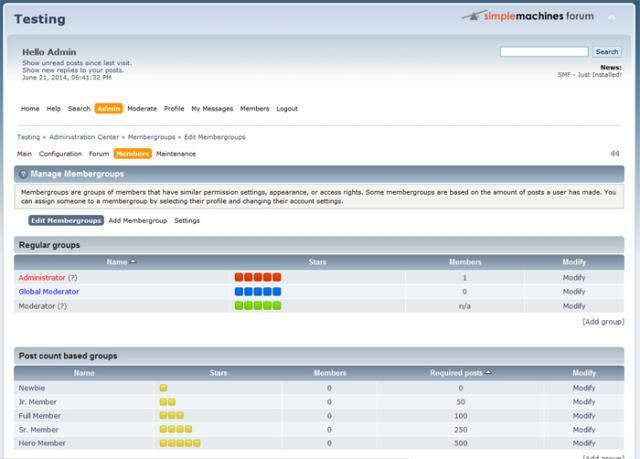 The screenshots below will give you a preview on how an admin demo and demo forum look like. You can also set up your own Simple Machines Forum demo and go through the admin demo by clicking on the link below to download the latest version available. However, you are advised to read the license before, as it has important agreements in it. On their official website you can find many examples of themes that will help you customize your online demo. Simple Machines Forum is designed to have minimal impact on your server resources while providing you with all the features you need for a bulletin board. The latest version available for download is 2.0.15 and it became available on June 1, 2017. It was released under the SMF 2: 3-clause BSD License.